just because you’re not drunk that doesn’t mean that you’re not impaired.When Paula Grzelak-Schultz spotted a piece of paper tucked under her windshield wipers, she thought she was getting fined for leaving her car in a bar parking lot overnight. With a heavy sigh, Grzelak-Schultz removed the paper and unlocked her car. But when she unfolded the paper, she was surprised to find out it wasn’t a ticket after all. 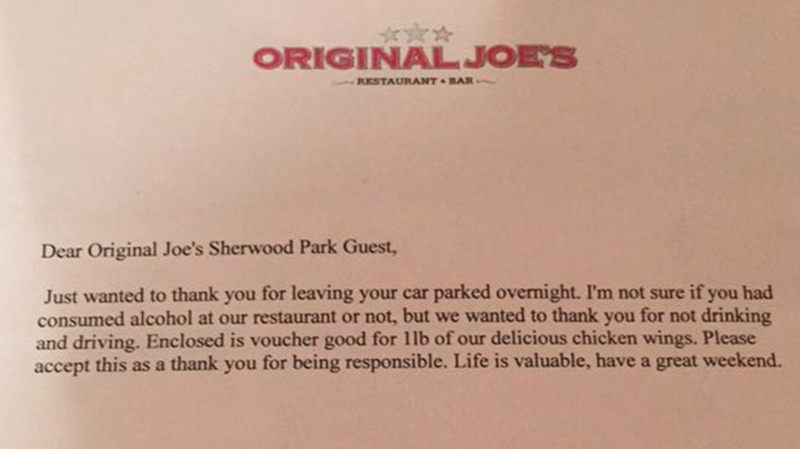 Instead, it was a letter from the manager of Original Joe’s Restaurant & Bar in Sherwood Park, Canada. She decided to share the man’s good deed on Facebook. Exactly a week later, Grzelak-Schultz returned to the restaurant to thank McLean for his kindness, and discovered that she’s not the only patron to receive this letter. The restaurant eventually responded to the viral letter on their verified Facebook page. “Crazy how one act of kindness can go viral. We at Sherwood Park Original Joe’s just want everyone to make it home safe. Thank you for not drinking and driving!” the restaurant said.